Stir the herbs and black pepper on a plate. Coat the cheese with the herb mixture. Unfold the pastry sheet on a lightly floured surface. With the short side facing you, place the cheese on the bottom third of the pastry sheet to within 1 inch of the edge. Starting at the short side, roll up like a jelly roll. Place the filled pastry seam-side down onto a baking sheet. Tuck the ends under to seal. Brush the pastries with the egg wash.
Bake for 20 minutes or until the pastry is golden brown. Let the pastry cool on the baking sheet on a wire rack for 5 minutes. Cut the pastry into 8 slices. Beat the lemon juice, lemon zest, mustard, olive oil and canola oil in a large bowl. Add the salad mix and toss to coat. Divide the salad mixture among 8 plates. Top each with 1 slice cheese pastry. 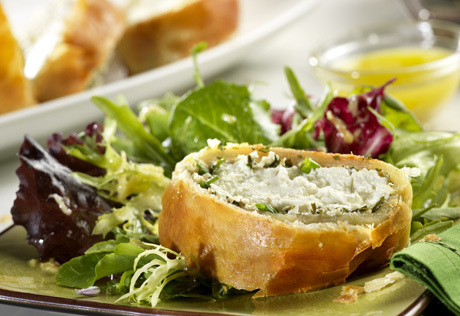 Time-Saving: To save on prep time, omit the plain goat cheese, pepper and herbs. Substitute a garlic and herb goat cheese and proceed as directed above.